(CNN) - Sen. Elizabeth Warren has a plan -- for just about everything. Asked about how she would expand voting rights, Warren described the process for electing presidents -- that race to 270 electoral votes -- as a de facto form of disenfranchising voters in states dominated by a single political party. 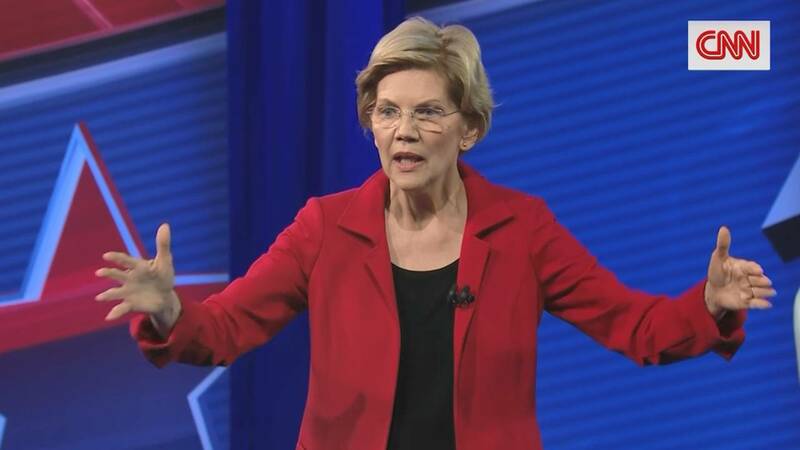 "Come a general election, presidential candidates don't come to places like Mississippi, they also don't come to places like California or Massachusetts, because we're not the battleground states," Warren said. The town hall audience was already cheering its approval as she added, "My view is that every vote matters and the way we can make that happen is that we can have national voting and that means get rid of the Electoral College." The issue has gained added traction with Democrats in the aftermath of Hillary Clinton's 2016 loss to President Donald Trump. Clinton won by nearly 3 million votes but was upset by Trump, who narrowly carried a raft of swing states in the Upper Midwest. Republicans have won the White House in three of the of the last five races, but only once -- in 2004 -- did the GOP candidate win the popular vote. Warren, who has made proposals to close the racial wealth gap a staple of her stump speech, was asked about it early on in the night and said she would back congressional legislation that, according to its mandate, would form a panel "to examine slavery and discrimination in the colonies and the United States from 1619 to the present and recommend appropriate remedies." "I believe it's time to start the national, full-blown conversation about reparations," Warren said. "That means I support the bill in the House to appoint a congressional panel of experts, of people who are studying this, who talk about different ways we may be able to do it, and to make a report back to Congress so that we can as a nation do what's right and begin to heal." Asked by Tapper if she would be open to monetary compensation, Warren said she was willing to consider "a lot of ways" reparations could be formulated. "Ignoring the problem," she said, "is not working." When she was young, her father suffered a heart attack and the family was thrust into financial peril. Staring down the possibility of losing their home, Warren's mother -- alone, scared and determined, repeating, "We will not lose this house" -- entered the workforce on a minimum wage job. "For a long time I used to think that was just a story about my mother," Warren said in Jackson. "Years later I came to understand that it's the story of millions of Americans who -- it doesn't matter if you're scared -- when you got to do something to take care of the people you love, you reach down and you find it and you pull it up." The backlash to Warren's past claims to Native American heritage has mostly died down following a series of apologies to tribal leaders. But on Monday, she was asked again why she did what she did -- and faced the suggestion from a voter that it was "tone deaf and indicative of a lack of presidential tact." Warren in response said that the stories she told were the ones she heard growing up in Oklahoma, what she "learned about my family from my family," before pivoting to what she said voters wanted to hear about (hint: not this). Still, her past assertions and her decision to use a DNA test -- which set off an uproar among tribes who viewed it as damaging to their sovereignty -- are likely to linger in the background of her candidacy, along with the potential for more embarrassing revelations. Warren has consistently apologized and, in February, went directly to the Cherokee Principal Chief Bill John Baker to say she meant no "harm." "I'm not a tribal citizen and I respect the difference," Warren told CNN at the time. "Tribes and only tribes determine tribal citizenship." Warren on health care and different "paths"
Warren signed on to Sen. Bernie Sanders' "Medicare for all" bill, like so many other 2020 Democratic contenders in the Senate, but on Monday again suggested that she would be open multiple paths to universal coverage -- including less aggressive transitions and plans that might keep the private insurance industry in the game. "When we talk about Medicare for All, there are a lot of different pathways," Warren said. "What we're all looking for is the lowest cost way to make sure that everybody gets covered." "That helps cover people who are most at risk," she said, but also suggested the possibility -- as some activists have discussed -- of starting with younger Americans. "Some people say do it the other way. Let's bring it up from -- everybody under 30 gets covered by Medicare." Warren also signaled her willingness to back plans, many of them already baked into legislation from her colleagues in Washington, that would allow people to buy in to public programs if they don't want to be covered by the private insurance offered by their employers. "For me what's key is we get everybody at the table on this," she said -- an answer that satisfied the audience but is likely to cause some grumbling among progressives.